Jack Brutus, Connecticut War Dog – Who Knew? 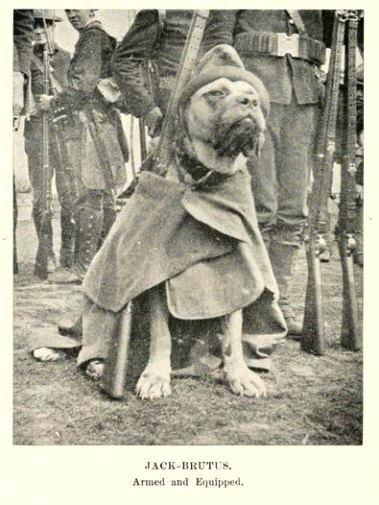 … that although Jack Brutus’s military status was unofficial, he became the official mascot of Company K of the First Connecticut Volunteer Infantry during the Spanish-American War. Jack Brutus, or “Old Jack” as he became known, was born in Cumberland, Maine, in 1891. He led an exciting life even before his stint in the military as part of Company K of the First Connecticut Volunteer Infantry. According to Private George B. Thayer (who wrote Company K’s history), Jack “had friends in most of the cities in New England through his associations with the traveling public at the West End Hotel in Portland. Frequently he visited them in their own homes, taking passage in some steamer or boarding some train, and returning to Portland in due time.” In his travels, Thayer claims Jack Brutus visited Boston, New Brunswick, and New York, as well as many other cities on the steamer lines. Company K first met Old Jack while stationed at Fort Preble in Portland, Maine, in May of 1898. Jack quickly became a favorite of the soldiers and, eventually, the company’s official mascot. He went on to travel with the unit as they encamped up and down the Eastern Seaboard providing coastal defense during the Spanish-American War. Jack was a large breed dog and often had health issues throughout his service with Company K. During a heat spell at Camp Alger near Falls Church, Virginia, Jack had trouble breathing and suffered in the heat. Thayer noted, “Poor Jack—the noble mastiff we brought from Portland is suffering from the heat extremely and it is doubtful if he survives.” Fearing for Jack’s life, the men took to nursing him and he eventually recovered. Jack also had a snoring problem. 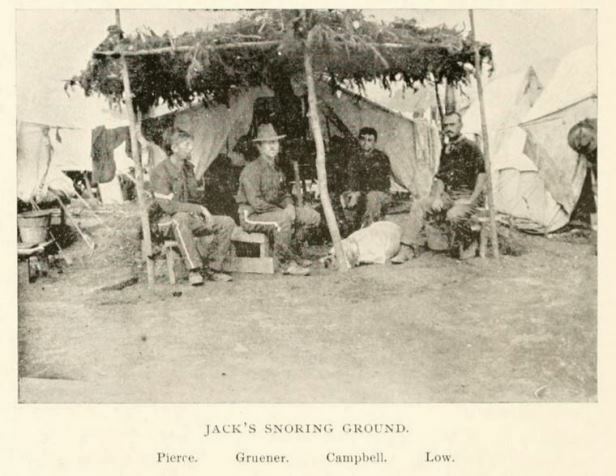 The men on night duty, to allow the men asleep in their tents to remain that way, often enticed Jack far away from camp so that his snoring did not disturb the sleeping soldiers. When “loudest snorer” elections took place among the men, Jack came in second. Wagoner Edward Ahearn mustered out of the army in late 1898, and when he did, he took Jack Brutus home with him. Old Jack died from spinal troubles and constipation while under a physician’s care on November 20, 1898, but will always be remembered as a loyal Connecticut war dog. Thayer, George B. (George Burton), ed. History of Company K, First Connecticut Volunteer Infantry, During the Spanish-American War. Hartford, CT: Press of R.S. Peck & Co., 1899. Link.